Last Saturday, Occupy Chicago had a monumental day—the evening march clocked in at over a thousand, 175 of which ended the night in police custody. Now the group is considering what's next—no one knows what they'll ask for, or where they'll go. Although its size and influence has grown, many members still see their nascent movement shunned by politicians and vilified by the media. Naturally, they brought in someone familiar with both experiences. 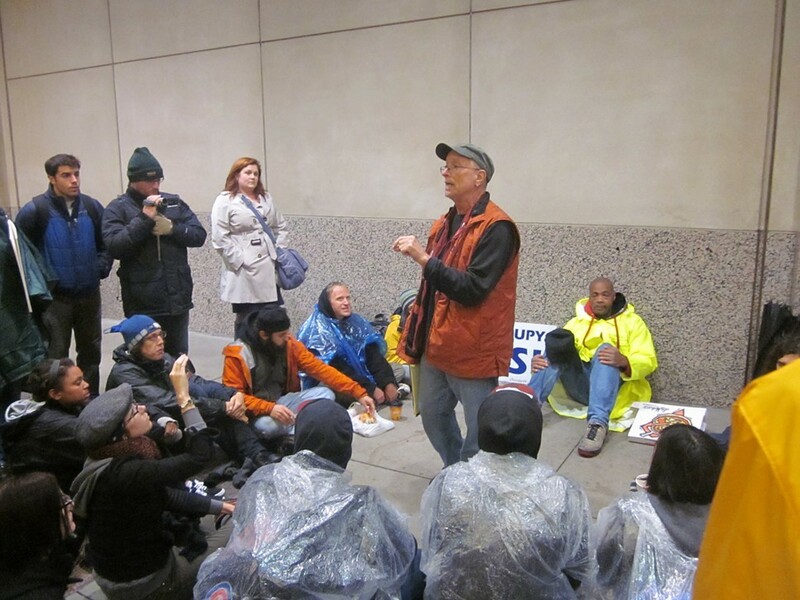 Yesterday afternoon, Bill Ayers, the retired UIC professor and onetime household name, led a "teach-in" with the protesters. He detailed the tactics and history of the Civil Rights movement, drawing analogies to the group before him. "You created power where there was none," the famed agitator said. 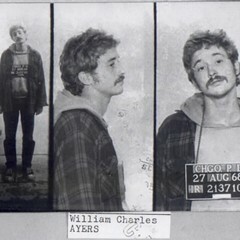 Bill Ayers is the human wormhole linking those mythical dirty, un-American hippies of the 1960s to the Obama administration to the also-dirty socialists of the rising #occupy movement. But in his hometown, the "human wormhole" didn't stir a single counter-protester. With a cold, steady rain downtown, yesterday marked the first serious test of what's in store for the Chicago Occupiers. 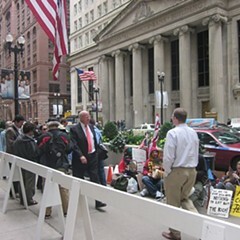 A dozen lingered at their normal spot, but the "teach-in" had mercifully moved to a sheltered walkway across the street, beside the Chicago Board of Trade. And the group abandoned the echoing "people's mic," allowing Ayers to speak naturally to the crowd of 40, who sat in rapture, registering their approval by lifting silent fingers. "It's critical that you maintain your independence," Ayers told the crowd. He warned them about being co-opted by a larger party, like labor unions or the Democrats. History, he explained, shows his preferred approach to political power. "Martin Luther King didn't go begging for a meeting with Lyndon Johnson," Ayers said. "Lyndon Johnson begged for a meeting with Martin Luther King." In a way, the protesters have already followed his advice. According to the Tribune, the group turned down Mayor Emanuel's proposition for a meeting, demanding the misdemeanor charges from Saturday's arrest be dropped first. So the group moved further south, settling in a corner of the Metra station at One Financial Plaza. There, Ayers fielded questions about the Tea Party (he's writing a book on his interactions with their members) and his advice to the movement ("talk to strangers"). Twenty minutes passed, and another security guard showed up. Private property again. Ayers got in a few more words, then the group disbanded. As we moved between the locations, I ran into Dorothy Conway, a protester I had met three weeks ago. She said the protesting was going smoothly, but with one major annoyance, "We spend a lot of time," she said, "shuffling around to look for a place to peacefully assemble."